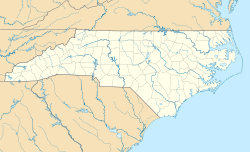 Chapel Hill is a town in Orange, Chatham, and Durham counties in the U.S. state of North Carolina. Its population was 57,233 in the 2010 census, making Chapel Hill the 15th-largest city in the state. Chapel Hill, Durham, and the state capital, Raleigh, make up the corners of the Research Triangle (officially the Raleigh–Durham–Chapel Hill combined statistical area), with a total population of 1,998,808. The town was founded in 1793 and is centered on Franklin Street, covering 21.3 square miles (55 km2). It contains several districts and buildings listed on the National Register of Historic Places. The University of North Carolina at Chapel Hill and UNC Health Care are a major part of the economy and town influence. Local artists have created many murals. The area was the home place of early settler William Barbee of Middlesex County, Virginia, whose 1753 grant of 585 acres from John Carteret, 2nd Earl Granville was the first of two land grants in what is now the Chapel Hill-Durham area. Though William Barbee died shortly after settling there, one of his eight children, Christopher Barbee, became an important contributor to his father's adopted community and to the fledgling University of North Carolina. Chapel Hill has developed along a hill; the crest was the original site of a small Anglican "chapel of ease", built in 1752, known as New Hope Chapel. The Carolina Inn now occupies this site. In 1819, the town was founded to serve the University of North Carolina and developed around it. The town was chartered in 1851, and its main street, Franklin Street, was named in memory of Benjamin Franklin. In 1969, a year after the city fully integrated its schools, Chapel Hill elected Howard Lee as mayor. It was the first majority-white municipality in the South to elect an African-American mayor. Serving from 1969 until 1975, Lee helped establish Chapel Hill Transit, the town's bus system. Some 30 years later, in 2002, the state passed legislation to provide free service to all riders on local buses. The bus operations are funded through Chapel Hill and Carrboro town taxes, federal grants, and UNC student fees. The change has resulted in a large increase in ridership, taking many cars off the roads. Several hybrid and articulated buses have been added recently. All buses carry GPS transmitters to report their location in real time to a tracking web site. Buses can transport bicycles and have wheelchair lifts. In 1993, the town celebrated its bicentennial and founded the Chapel Hill Museum. This cultural community resource "exhibiting the character and characters of Chapel Hill, North Carolina" includes among its permanent exhibits Alexander Julian, History of the Chapel Hill Fire Department, Chapel Hill's 1914 Fire Truck, The James Taylor Story, Farmer/James Pottery, and The Paul Green Legacy. In addition to the Carolina Inn, the Beta Theta Pi Fraternity House, Chapel Hill Historic District, Chapel Hill Town Hall, Chapel of the Cross, Gimghoul Neighborhood Historic District, Alexander Hogan Plantation, Old Chapel Hill Cemetery, Old East, University of North Carolina, Playmakers Theatre, Rocky Ridge Farm Historic District, and West Chapel Hill Historic District are listed on the National Register of Historic Places. Chapel Hill is located in the southeast corner of Orange County. It is bounded on the west by the town of Carrboro and on the northeast by the city of Durham. However, most of Chapel Hill's borders are adjacent to unincorporated portions of Orange and Durham Counties rather than shared with another municipality. According to the United States Census Bureau, the town has a total area of 21.3 square miles (55.1 km2), of which 21.1 square miles (54.7 km2) is land and 0.15 square miles (0.4 km2) is covered by water. Durham, North Carolina, is the core of the four-county Durham-Chapel Hill MSA, which has a population of 504,357 as of Census 2010. The US Office of Management and Budget also includes Chapel Hill as a part of the Raleigh-Durham-Cary Combined Statistical Area, which has a population of 1,749,525 as of Census 2010. Effective June 6, 2003, the Office of Management and Budget redefined the federal statistical areas and dismantled what had been for decades the Raleigh-Durham-Chapel Hill MSA, and split them into two separate MSAs, though the region still functions as a single metropolitan area. According to the 2010 U.S. Census, 57,233 people in 20,564 households resided in Chapel Hill. The population density was 2,687 people per square mile (1037/km²). The racial composition of the town was 72.8% White, 9.7% African American, 0.3% Native American, 11.9% Asian, 0.02% Pacific Islander, 2.7% some other race, and 2.7% of two or more races. About 6.4% of the population was Hispanic or Latino of any race. Of the 20,564 households, 51.1% were families, 26.2% of all households had children under the age of 18 living with them, 40.2% were headed by married couples living together, 8.2% had a female householder with no husband present, and 48.9% were not families. About 30.6% of all households were made up of individuals, and 7.7% had someone living alone who was 65 years of age or older. The average household size was 2.35 and the average family size was 2.98. In the town, the population was distributed as 17.4% under the age of 18, 31.5% from 18 to 24, 23.6% from 25 to 44, 18.4% from 45 to 64, and 9.2% who were 65 years of age or older. The median age was 25.6 years. For every 100 females, there were 87.2 males. For every 100 females age 18 and over, there were 83.6 males. According to estimates released by the U.S. Census Bureau, over the three-year period of 2005 through 2007, the median income for a household in the town was $51,690, and for a family was $91,049. Males had a median income of $50,258 versus $32,917 for females. The per capita income for the town was $35,796. About 8.6% of families and 19.8% of the population were below the poverty line, including 8.6% of those under age 18 and 5.6% of those age 65 or over. Chapel Hill is North Carolina's best-educated municipality, proportionately, with 77% of adult residents (25 and older) holding an associate degree or higher, and 73% of adults possessing a baccalaureate degree or higher. Chapel Hill uses a council-manager form of government. The community elects a mayor and eight council members. Mayors serve two-year terms, and council members serve staggered four-year terms. Mayor Pam Hemminger, a former board of education member, was elected in 2015 and re-elected in 2017. She defeated incumbent Mark Kleinschmidt, who in 2009 had been elected the first openly gay mayor of Chapel Hill, succeeding outgoing four-term Mayor Kevin Foy. The Chapel Hill-Carrboro school district covers most of the towns of Chapel Hill and Carrboro, along with portions of unincorporated Orange County, and is recognized for its academic strengths. East Chapel Hill High School, Carrboro High School, and Chapel Hill High School have all received national recognition for excellence, with Newsweek in 2008 ranking East Chapel Hill High as the 88th-best high school in the nation, and the highest-ranked standard public high school in North Carolina. The small portion of Chapel Hill located in Durham County is part of Durham Public Schools. Among the town's private institutions is the Emerson Waldorf School. The state's main youth orchestra, Piedmont Youth Orchestra, is based in Chapel Hill. Though Chapel Hill is a principal city of a large metropolitan area, it retains a relatively small-town feel. Combined with its close neighbor, the Chapel Hill-Carrboro area has roughly 85,000 residents. Many large murals can be seen painted on the buildings. Most of these murals were painted by UNC alumnus Michael Brown. Also, for more than 30 years, Chapel Hill has sponsored the annual street fair, Festifall, in October. The fair offer booths to artists, craftsmakers, nonprofits, and food vendors. Performance space is also available for musicians, martial artists, and other groups. The fair is attended by tens of thousands each year. A variety of corporations are headquartered in Chapel Hill. Health insurance provider Blue Cross and Blue Shield of North Carolina was one of the town's 10 largest employers. Technology companies USAT Corp and Realtime Ops have made Chapel Hill their headquarters location. Journalistic, Inc., the publisher of the nationally acclaimed magazines Fine Books & Collections, QSR, and FSR recently relocated from Durham to Chapel Hill. New companies are selecting the town as their base of operations such as the service company Alpha Install. The Morehead Planetarium was the first planetarium built on a U.S. college campus. When it opened in 1949, it was one of six planetariums in the nation and has remained an important town landmark. During the Mercury, Gemini, and Apollo programs, astronauts were trained there. One of the town's hallmark features is the giant sundial, located in the rose gardens in front of the planetarium on Franklin Street. Chapel Hill also has some new urbanist village communities, such as Meadowmont Village and Southern Village. Meadowmont and Southern Village both have shopping centers, green space where concerts and movies take place, community pools, and schools. Also, a traditional-style mall with a mix of national and local retailers is located at University Place. 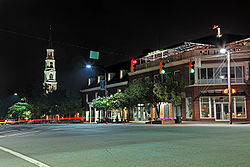 In 2009, Chapel Hill ranked number three on Newsmax magazine's list of the "Top 25 Most Uniquely American Cities and Towns", a piece written by current CBS News travel editor Peter Greenberg. According to the magazine, Greenberg based the rankings on a variety of features, such as quality of schools and proximity to medical care, as well as culture, hospitality, and scenic beauty. Hailed as one of America's Foodiest Small Towns by Bon Appétit, Chapel Hill is rapidly becoming a hot spot for pop American cuisine. Among the restaurants noted nationally are Al's Burger Shack, A Southern Season, Foster's Market (Martha Stewart's Living), Mama Dip's (Food Network's "$40 A Day With Rachael Ray"), Crook's Corner, Sunrise Biscuit Kitchen (The Splendid Table), caffè Driade (Food Network's "$40 A Day With Rachael Ray"), Lantern Restaurant (Food & Wine magazine, Southern Living magazine, etc. ), and Vimala's Curryblossom Cafe. Chapel Hill also has a vibrant music scene. Classical composers on the faculty of UNC Chapel Hill include Allen Anderson, Stefan Litwin, and Lee Weisert. In the realm of popular music, Alternative States, Remington Brown, Archers of Loaf, Squirrel Nut Zippers, James Taylor, George Hamilton IV, Southern Culture on the Skids, Superchunk, Polvo, Ben Folds Five, and more recently Porter Robinson, are among the most notable musical artists and acts whose careers began in Chapel Hill. The town has also been a center for the modern revival of old-time music with such bands as the Ayr Mountaineers, Hollow Rock String band, Mandolin Orange, the Tug Creek Ramblers, Two Dollar Pistols, the Fuzzy Mountain String band, Big Fat Gap and the Red Clay Ramblers. Chapel Hill was also the founding home of now Durham-based Merge Records. Bruce Springsteen has made a point to visit the town on four occasions. His most recent appearance was on September 15, 2003, at Kenan Memorial Stadium with the E Street Band. U2 also performed at Kenan on the first American date of their 1983 War Tour, where Bono famously climbed up to the top of the stage, during pouring rain and lightning, holding up a white flag for peace. The 2011 John Craigie song, "Chapel Hill", is about the singer's first visit there. One song from Dirty, a Sonic Youth album, is named after the town. The University of North Carolina has been very successful at college basketball and women's soccer, and a passion for these sports has been a distinctive feature of the town's culture, fueled by the Tobacco Road rivalry among North Carolina's four ACC teams: the North Carolina Tar Heels, the Duke Blue Devils, the NC State Wolfpack, and the Wake Forest Demon Deacons. The two largest sports venues in the town both house UNC teams. The Dean Smith Center is home to the men's basketball team, while Kenan Memorial Stadium is home to the football team. In addition, Chapel Hill is also home to Carmichael Arena which formerly housed the UNC men's basketball team, and currently is home to the women's team, and to Fetzer Field, home to men's and women's soccer and lacrosse teams. Many walking/biking trails are in Chapel Hill NC. Some of these include Battle Branch Trail and Bolin Creek Trail. WCHL: local AM radio station (1360AM, 97.9FM) providing talk radio, news, and local sports coverage as the flagship station of the Tar Heel Sports Network. WXYC: noncommercial student-run radio station (89.3FM) on the UNC campus. In 1994, it became the first radio station in the world to broadcast over the internet. The Daily Tar Heel is the nationally ranked, independent student newspaper that serves the university and the town. The free newspaper is printed thrice weekly during the academic year and weekly during summer sessions. The Sun Magazine is an independent, ad-free magazine that for more than 40 years has published personal essays, interviews, short stories, poetry, and photographs. Carrboro Citizen was a locally owned community newspaper covering local news, politics and town government of Chapel Hill and Carrboro. The last issue was published in October 2012. Chapel Hill has free intracity bus service via Chapel Hill Transit. Go Triangle provides connection to the rest of the Triangle (Raleigh, Durham, and Hillsborough), of which the Hillsborough service is operated by Chapel Hill Transit, and supplemented mid-day by a county shuttle. A light rail service between Chapel Hill and Durham entered the engineering phase in August 2017. Aziz Sancar, Nobel Prize winner in Chemistry 2015. Stephen Barrett, retired psychiatrist, webmaster of Quackwatch. Lawrence Ferlinghetti, Beat Generation poet and co-founder of City Lights Book Sellers & Publishers. Earned a B.A. in Journalism from UNC-Chapel Hill in 1941. Richard Trice, blues guitarist, singer and songwriter. Thomas Wolfe, author. UNC alumnus. Chapel Hill appears as "Pulpit Hill" in his posthumous novel You Can't Go Home Again. ^ "Tax Payments". Town of Chapel Hill. 2011. Archived from the original on September 24, 2011. Retrieved July 29, 2011. Chisholm, Hugh, ed. (1911). "Chapel Hill" . Encyclopædia Britannica. 5 (11th ed.). Cambridge University Press. p. 851. ^ a b "Fun Facts About Chapel Hill and UNC". Chapel Hill/Orange County Visitors Bureau. 2008. Archived from the original on June 28, 2011. Retrieved July 5, 2011. ^ Nicholas Graham (2004). "This Month in North Carolina History". UNC University Libraries. Retrieved August 16, 2011. ^ "Ongoing Exhibits". The Chapel Hill Museum. 2011. Retrieved August 3, 2011. ^ "Geographic Identifiers: 2010 Demographic Profile Data (G001): Chapel Hill town, North Carolina". U.S. Census Bureau, American Factfinder. Archived from the original on September 11, 2013. Retrieved January 3, 2012. ^ "Climatology of the United States No. 20: CHAPEL HILL 2 W, NC 1971–2000" (PDF). National Oceanic and Atmospheric Administration. February 2004. Archived from the original (PDF) on August 29, 2014. Retrieved July 7, 2014. ^ "Monthly Averages for Chapel Hill, NC (27514)". The Weather Channel. Retrieved July 7, 2014. ^ a b c "Profile of General Population and Housing Characteristics: 2010 Demographic Profile Data (DP-1): Chapel Hill town, North Carolina". U.S. Census Bureau, American Factfinder. Archived from the original on September 11, 2013. Retrieved January 3, 2012. ^ "Chapel Hill town, North Carolina, Census.gov". Factfinder.census.gov. Retrieved August 23, 2012. ^ Grubb, Tammy (November 7, 2017). "Pam Hemminger outpaces write-in challenger Eugene Farrar in Chapel Hill mayor's race". Herald Sun. Retrieved December 22, 2017. ^ Stasio, Frank (November 5, 2014). "Chapel Hill's First Openly-Gay Mayor Reflects On His Home". WUNC (FM). Retrieved June 15, 2015. ^ "MINUTES OF A MEETING OF THE MAYOR AND COUNCIL OF THE TOWN OF CHAPEL HILL, NORTH CAROLINA, MONDAY, SEPTEMBER 24, 1990 AT 7:30 pm". Town Hall. September 24, 1990. Retrieved August 1, 2011. ^ "Resolution to Update Town Seal". Town of Chapel Hill. April 11, 2005. ^ "Murals". UNC The Graduate School. 2004. Retrieved July 15, 2011. ^ "Festifall 2011". Town of Chapel Hill. 2011. Archived from the original on July 28, 2011. Retrieved July 5, 2011. ^ "Theaters and Performing Arts". Chapel Hill Downtown Partnership. 2011. Retrieved August 1, 2011. ^ "Morehead History construction". Morehead Planetarium and Science Center. 2011. Archived from the original on September 30, 2003. Retrieved July 5, 2011. ^ "Morehead History Astronaut Training". Morehead Planetarium and Science Center. 2011. Archived from the original on November 5, 2003. Retrieved July 5, 2011. ^ "Welcome to Southern Village". Southernvillage.com. Retrieved January 10, 2016. ^ "Newsmax Magazine Rates the Top 25 Most Uniquely American Cities And Towns". Newsmax.com. Retrieved January 10, 2016. ^ Andrew Knowlton (2008). "America's Foodiest Small Town". Bon Appétit. Retrieved February 10, 2014. ^ a b "$40 A Day". Food Network. 2008. Archived from the original on September 7, 2011. Retrieved July 5, 2011. ^ Grubb, Tammy (September 27, 2015). "Vimala's Curryblossom Cafe starts next 5 years with $100,000 recipe for success". The News & Observer. Retrieved December 26, 2017. ^ "Faculty - Department of Music". Music.unc.edu. Retrieved January 10, 2016. ^ "Music of the Red Clay Ramblers". Originalredclayramblers.com. Retrieved January 10, 2016. ^ "John Craigie's New Album "October is The Kindest Month" is a Work of Art from Beginning To End". Jambandfriendly.com. October 11, 2011. Retrieved January 10, 2016. ^ "Trails in Chapel Hill NC". ChapelHillTownGuide.com. Archived from the original on November 22, 2012. Retrieved March 17, 2013. ^ "About the Station". Chapelboro.com. 2011. Archived from the original on July 17, 2011. Retrieved July 6, 2011. ^ "About WUNC". WUNC. Retrieved July 6, 2011. ^ "About WXYC". WXYC. Retrieved July 6, 2011. ^ "About The Daily Tar Heel". The Daily Tar Heel. 2018. Retrieved March 22, 2018. ^ "About The Daily Tar Heel". The News and Observer Publishing Company. 2011. Archived from the original on September 27, 2011. Retrieved July 6, 2011. ^ "About The Sun". The Sun. 2015. Retrieved July 24, 2015. ^ "About The Carrboro Citizen". The Carrboro Citizen. 2011. Retrieved July 6, 2011. ^ "Sister Cities: Chapel Hill & San Cristobal". Center for Galapagos Studies Development. 2011. Archived from the original on November 4, 2011. Retrieved July 15, 2011. ^ "UNC Chapel Hill Scientist Aziz Sancar Wins Nobel Prize for Chemistry". Retrieved March 1, 2017. ^ "Feeding Young Minds". Independent Weekly. Retrieved September 16, 2009. ^ "CISE Fellow Press Release". Retrieved April 12, 2014. ^ Wlazelek, Ann (June 13, 2007). "Allentown critic of quacks moves to 'milder winters'". The Morning Call. Retrieved September 25, 2014. ^ "Lewis Black's Official Web Site". Archived from the original on August 10, 2010. Retrieved August 14, 2010. ^ "Polvo". Retrieved July 15, 2009. ^ "Our People - Computer Science". Cs.unc.edu. Retrieved January 10, 2016. ^ Gary Parrish. "Hubert Davis leaves TV for North Carolina assistant coaching gig - NCAA Division I Mens Basketball". CBSSports.com. Retrieved January 10, 2016. ^ "Sarah Dessen". Sarah Dessen. Retrieved January 10, 2016. ^ "Rielle Hunter says she's still 'very close friends' with John Edwards". POLITICO. Retrieved 2018-02-07. ^ Gibson, Dale (July 7, 2008). "John Grisham and wife buy home in Chapel Hill". Triangle Business Journal. Retrieved September 16, 2009. ^ "Jack Hogan Biography". IMDB. Retrieved 6 September 2017. ^ "30 Years of Uncommon Threads". The Chapel Hill Museum. 2007. Retrieved August 1, 2011. ^ "Chris Stamey | WUNC". wunc.org. Retrieved 2017-12-29. ^ "Daniel Wallace | English & Comparative Literature". Englishcomplit.unc.edu. August 24, 2015. Archived from the original on February 7, 2016. Retrieved January 10, 2016. ^ "★ Roy Williams Address". Fanmail.biz. Retrieved January 10, 2016. ^ Applebome, Peter (May 28, 1999). "The New York Times". Retrieved January 11, 2013. ^ "Cam Cameron Record, Statistics, and Category Ranks". Pro-Football-Reference.com. Retrieved January 10, 2016. ^ "Underoath Official Web Site". Archived from the original on December 19, 2008. Retrieved July 15, 2009. ^ "Fred Cole, Historian; Led Library Council". New York Times. May 8, 1986. Retrieved December 27, 2015. ^ "Walter Davis dies at 88". News & Observer. May 20, 2008. Archived from the original on May 10, 2011. Retrieved August 1, 2011. ^ Rob Christensen (December 8, 2010). "Elizabeth Edwards' death closes full, public life". News & Observer. Archived from the original on November 4, 2011. Retrieved August 1, 2011. ^ "Biography for Meredith Hagner". IMDB. 2011. Retrieved August 1, 2011. ^ "Career Stats". Major League Baseball. 2011. Retrieved August 3, 2011. ^ "Charles Kuralt biography". UNC School of Journalism and Mass Communication. 2011. Archived from the original on July 22, 2011. Retrieved August 3, 2011. ^ "WILLIAM CARTER LOVE | C-SPAN.org". www.c-span.org. Retrieved 2018-10-12. ^ "The Sand Pebbles - Richard McKenna (1913-1964)". Boise Weekly. April 8, 1999. Retrieved 23 February 2018. ^ Marty Ravellette; Reporter: Scott Mason, Photographer: Robert Meikle (September 11, 2007). No arms needed for Marty Ravellette (Television). Chapel Hill, North Carolina: WRAL News. ^ "The Borough of Writers: Betty Smith: 'Francie or Sophina?'". Retrieved November 10, 2009. ^ "Precious Memories - The Dean Smith story". Espn.go.com. March 5, 2014. Retrieved January 10, 2016. ^ "Leo Henryk Sternbach". Encyclopædia Britannica. Encyclopædia Britannica, inc. Retrieved June 10, 2017. ^ RoAnn Bishop (2005). "Who Did That Sign Say?" (PDF). North Carolina Museum of History. Archived from the original (PDF) on July 27, 2011. Retrieved August 1, 2011. ^ a b Eagle, Bob; LeBlanc, Eric S. (2013). Blues - A Regional Experience. Santa Barbara: Praeger Publishers. pp. 279–280. ISBN 978-0313344237. ^ "Bayard Morgan Wootten Photographic Collection, circa 1870–1988 (bulk 1904–1954)". finding-aids.lib.unc.edu. Retrieved 2017-03-11. Wikimedia Commons has media related to Chapel Hill, North Carolina. Wikivoyage has a travel guide for Chapel Hill.